1. Payroll employment increased for the fifth straight month, as the U.S. economy added 192,000 payroll jobs in February, bringing the total increase to 671,000 jobs added since last October. Total employment according to the household survey (including self-employed and agriculture workers) increased by 250,000 jobs in February, following increases of 117,000 in January and 297,000 jobs in December. 2. The jobless rate fell to 8.9% in February, the lowest monthly rate since March 2009, and the third consecutive monthly decline. The last time the U.S. jobless rate decreased three straight months was in late 2003. 3. Employment in temporary help services continued to grow by 15,500 jobs in February, which is the 15th increase during the last 18 months. Since the cyclical low of 1.724 million jobs in September 2009, there has been an increase of almost half-a-million jobs in the temporary sector to 2.218 million jobs in February. That level of temporary and contract employment jobs is the highest since September of 2008, 28 months ago (see chart above). 4. 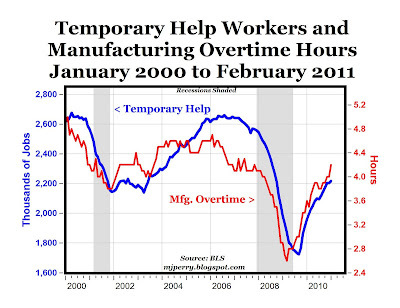 Overtime hours for the manufacturing sector, at an average of 4.2 hours per week, reached a 3-1/2 year high in February, the highest level of manufacturing overtime hours since June 2007 (see chart above). 5. Manufacturing employment increased by 15,500 jobs in February, which brings the total number of new manufacturing jobs over the last year to 189,000, the largest 12-month increase in factory jobs since 1998. Compared to the peak manufacturing jobless rate of 13% in January 2010, the February rate was down by more than three percent to 9.9%. Taken together, these employment trends suggest that many U.S. companies are meeting the increasing demand for their products and services by: a) continuing to rely on temporary and contract employees, and b) using existing employees more intensely with increased overtime hours in the manufacturing sector, but c) starting to hire more permanent workers as well. Further, the manufacturing sector of the U.S. economy continues to register some of the strongest signs of economic recovery, but we're starting to see positive signs of gradual, but ongoing improvements in the labor market overall (ongoing decreases in jobless claim, rising employment levels and a falling jobless rate). participation rate dropped to new cycle lows again (though by very little). Where are the lowest unemployment rates for Feb. 2011 according to the BLS Report? The Fed needs to pour it on. Employment is way too soft. Wow! 192,000 jobs in one month. Let’s see: 125,000 a month to absorb new entrants into the labor force and 67,000 a month to eliminate the millions unemployed. Unemployment will be solved in how many years? Maybe we should get to work on QE3, QE4, QE5,….QEn, and also work on redefining the definition of the workforce as better ways to reduce unemployment. Job creating tariffs, of course, being out of the question. Hmm, market down, Treasuries up, gold up...looks like this is a bad thing. What is needed, and is not happening, is additional investment by the private sector in America. But with Obamacare, Dodd-Frank, and seemingly a policy of dollar crushing QE, why would anyone invest in an illiquid asset (like a factory) here?